I don't know about you, but my bananas often ripen faster than I can consume them. 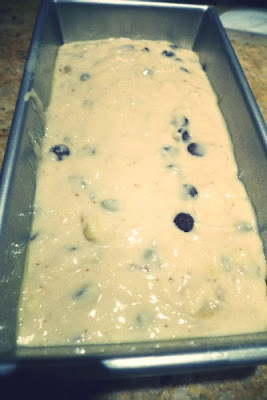 One trick that I've learned is to toss ripe bananas (unpeeled) as is, into your freezer. 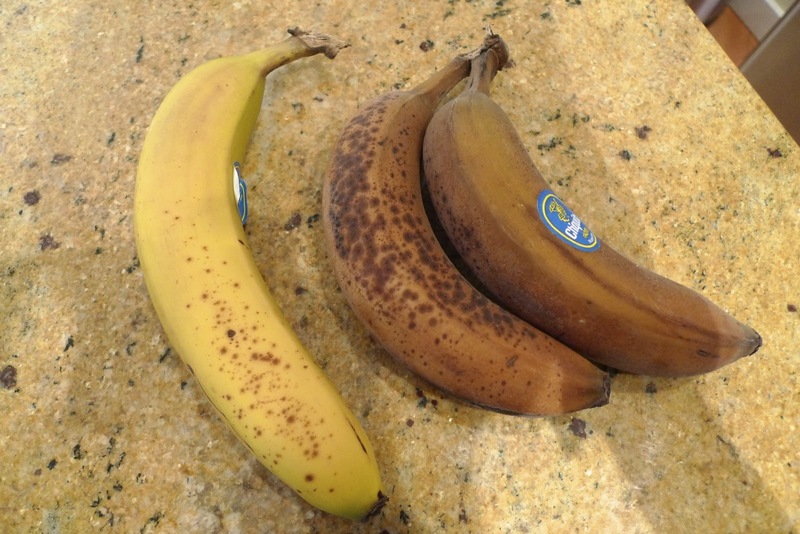 A frozen banana looks like the one to the right. I've discovered that frozen bananas are great in smoothies or in this banana bread. My roommate introduced me to this recipe and it's the bomb diggity, as my cousin Jung would say. When you are ready to use these bananas for the bread, you don't need to defrost them for that long. Just take them out for a few minutes before using, wait till it gets a little soft, run your knife down one of the sides and peel it off. My roommate recently peeled it using the vegetable peeler and she said it worked great too. 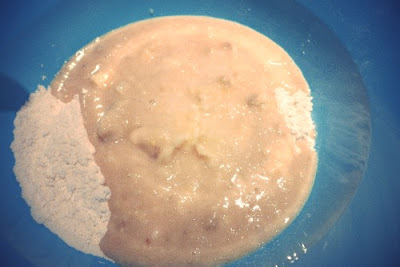 Toss the semi-frozen banana into a bowl, mush it up with your fork and you have ripe bananas ready for your recipe. I like freezing it in the peel because the fruit itself seems to retain a nice yellow color and it's so much easier to toss the whole thing into the freezer without having to wrap it in saran wrap. 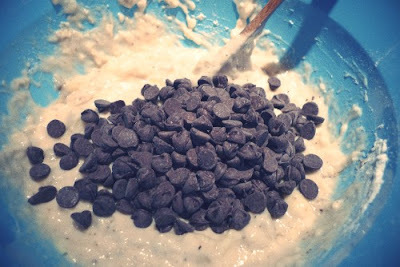 Now for the recipe! Preheat the oven to 350 degrees. Butter a loaf pan or muffin pan. In a medium bowl stir together the bananas, sugars, butter, milk, and egg. Set aside. In another medium bowl whisk together the flour, espresso, baking soda, and salt together. Make a well in the center of the flour bowl. 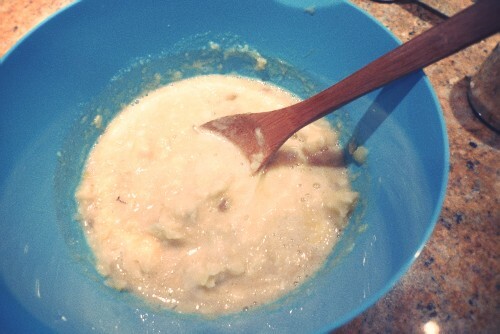 Pour the wet ingredients into the well and stir until just combined. Pour the batter into buttered loaf pan and bake for 30 minutes or until a toothpick inserted in the center comes out clean. It took an hour in my oven, not sure why. Cool the bread in the pan for 15 minutes before removing. Finish cooling on a wire rack. 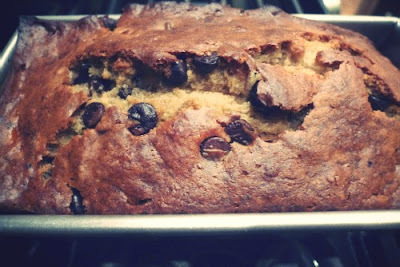 I love banana bread in it of itself, but toss in some chocolate chips and some espresso and it's elevated to a whole new level of awesomeness. I may try adding more espresso next time, so feel free to experiment with this recipe yourself as well. ooh definitely like the espresso addition in this recipe. You should definitely try it! It's really good!